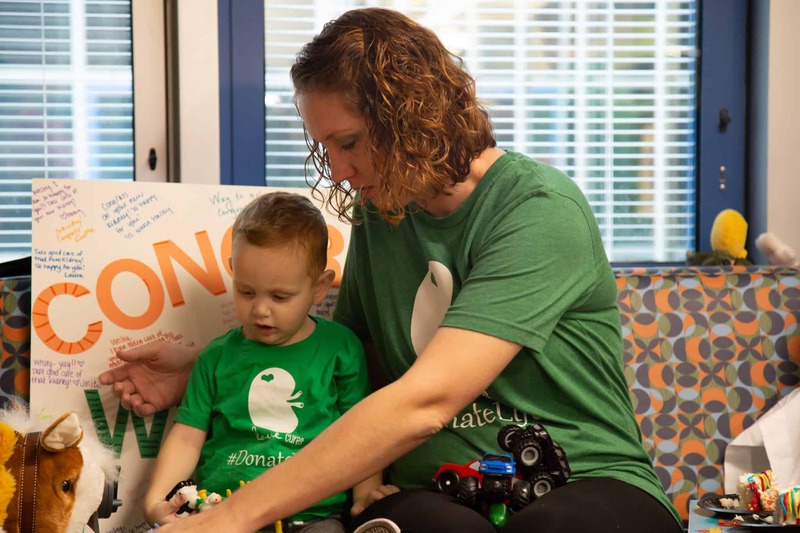 Jessica Stacy and her son Wesley play together days after their kidney surgeries. Nov. 28, 2018 | The pain following surgery ended up being greater than she anticipated, but Jessica Stacy says she wouldn’t change it for anything. 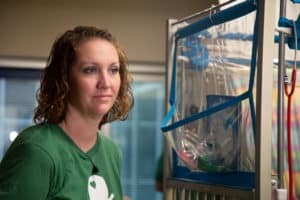 The Morrilton mother smiles as she watches her 2-year-old son play happily with his toys, 10 days after she’d given him one of her kidneys. Stacy was 16 weeks pregnant when her doctor discovered Wesley had posterior urethral valves. Posterior urethral valves occurs in about 1 in 8,000 baby boys. It happens when there are extra flaps of tissue growing in the urethra, preventing it from properly carrying urine from the bladder and out of the body. When urine cannot be expelled, organs in the urinary tract become swollen and damaged. “We knew that either of us would do whatever it took to help him,” Jessica Stacy said. 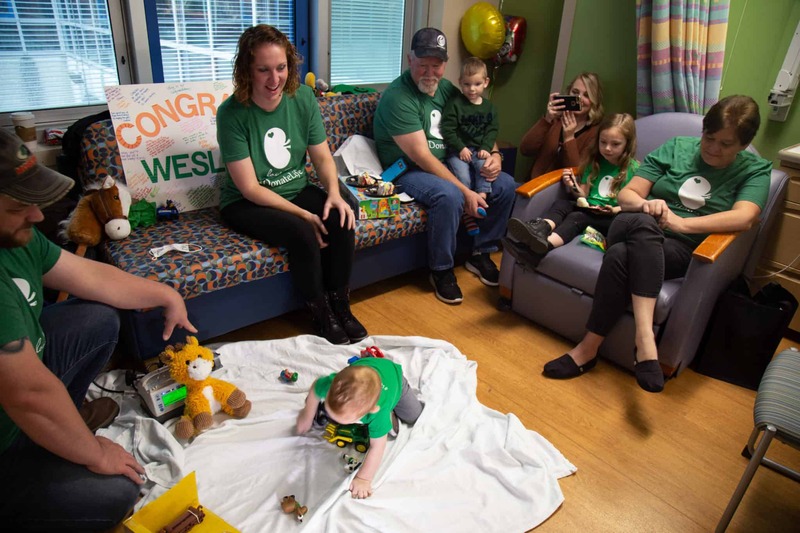 Wesley spent 100 days at Arkansas Children’s Hospital after his birth in Conway and had been hospitalized multiple times in his short life. 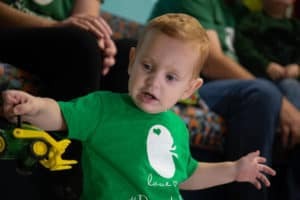 Doctors said he’d have to wait until he was 2 before he could receive a transplant. Wesley Stacy received a kidney from his mother Oct. 17. Stacy and Wesley went in for surgery Oct. 17. Stacy’s transplant surgeon was Gerardo Tamayo-Enriquez, M.D., an assistant professor in the UAMS College of Medicine Department of Surgery, Division of Transplant Surgery. Tamayo hopes more people will consider becoming a living donor. Researchers have studied the long-term health of living donors and have found that many of them actually have a longer life expectancy than the general population. Kidneys from living donors are also better for the recipient because they are outside the body for less time than a kidney from a deceased donor. On the day he was discharged, Arkansas Children’s threw a kidney party for Wesley. 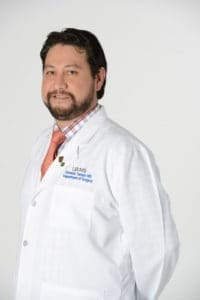 Tamayo says the chances of developing high blood pressure or diabetes (the two most common causes of kidney failure in the U.S) are the same with one or two kidneys. If the condition becomes severe enough, a patient with one kidney will develop renal failure more quickly. The other potential disadvantage is in the case of trauma. On the day he was discharged from the hospital, the transplant coordinator, physicians, nurses and counselors gathered with Stacy, Alan, Wesley and his sister, Reese, for a kidney party, complete with balloons, cake and toys.